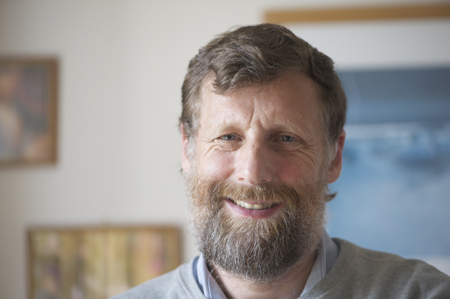 Alastair McIntosh is a writer, poet, speaker, researcher and activist. Originally from the Isle of Lewis he now lives on Govan near to the GalGael Trust, for which he is a founding trustee. “ Most of my work is constellated by a passion for community… I see the lack of it, or damage to it, as a prime driver of the the lack of meaning, emptiness and loneliness that underlies many of the world’s most pressing problems. Human ecology is therefore central to my work because it is the study of, and participation in, human community in relation to the wider natural environment. It therefore encompasses the great issues of our times, including the roots of war, poverty, meaninglessness and climate change. Sustainability at Glasgow School of Art. This entry was posted on December 19, 2014 at 7:06 pm and is filed under Artists, Knowledge, News. You can follow any responses to this entry through the RSS 2.0 feed. You can leave a response, or trackback from your own site.